Technology isn’t limited to the bigger things in life. Sure, putting people on Mars and self-driving vehicles sounds pretty great, but technology helping in day-to-day life is what we are really hungry to see. Smart homes and resulting gadgets are just the starts in making life more convenient every single day. One of the groundbreaking leaps we didn’t even know we needed is the future of beauty products. Considering cosmetics a technology might be a different thought for some, but that’s what it boils down to in the modern world. With a stronger technological aid to help people along in their everyday routines, we’re capable of expanding cosmetics even further than what we ever thought we could achieve. In the beginning, though, the change starts small by giving the power to the consumer. Here are five examples. Do-it-yourself (DIY) has become a popular concept in a technologically advanced world where money is scarce for many people. Not everyone can afford regular trips to the nail salon or spa, but everyone does want to look their best. These days, there are more ways for a person to create their very own skin care creams and cosmetics, as well as 3D printed customs, like nails. In addition to saving money in the long run, DIY saves people valuable time they could spend elsewhere, like with work or family, and helps consumers choose their own ingredients. Whether they’re allergic to a common ingredient or simply want to become more environmentally conscious, allowing consumers to personalise their products is becoming a serious trend in cosmetics. With augmented reality (AR) working with artificial intelligence (AI), we can find entirely new things about ourselves we didn’t consider possible. When considering L’Oreal’s ModiFace Skin AI, we’re talking more about health than mere beauty. ModiFace gives users a chance to get to know their skin along with dermatologists’ consultation. The app can pick up dark spots, discolouration, dryness, uneven skin and even rosacea. A significant and growing trend with these sort of apps is allowing the user to see changes for before and after they use a beauty product. It can even recommend other products to use to get the results the user wants. Apps like this are going to start becoming a serious trend very soon. Similar to that of ModiFace, Shiseido’s Optune goes a step further by utilising the Internet of Things (IoT). Using data from the IoT, Optune can personalise its interface with the skin type of the user all the way down to the conditions of the surrounding environment. Using a special algorithm, this app can find the best conditions for your particular skin for the best tone and moisturised state. The first part of Optune is called Optune Zero, which is what monitors the changes of your skin. It’s able to take information like temperature, humidity, mood and even menstrual cycle into account to tell the user the best thing they can do for their skin. The second part is called Optune Shot, which is how Optune sends you their recommended product for the day. The user has a special machine that fills a cartridge with the specific serum cream for their skin condition. Rimmel’s Get The Look app is, by contrast, much simpler than ModiFace or Optune but simple is all a person really needs. 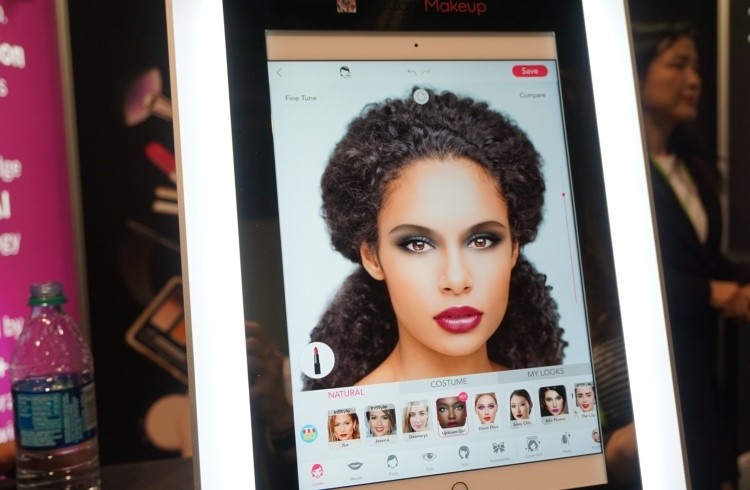 The app is simply a 3D AR experience to try on makeup after taking a photo of themselves. They can even take a photo of other makeup to try those products on. This sort of mirror or dressing room AR technology is becoming extremely popular with companies that specialise in beauty. Other brands like bareMinerals, Estée Lauder and Sephora are already on the train for virtual try-on apps. The benefit for the companies is not just getting people to easily try out their products, but also to collect more data on an individual so they can advertise much more effectively. All of the recommendations with this technology will be specially targeted ads to save time for both the company and the consumer. One of the many conveniences technology gives us is that we never really have to leave our homes again. This has become a double-edged sword for companies, but they’ve found a fantastic solution. Using the same technology, they’re able to give their in-store employees access to incredible amounts of information, so they can be far more reliable than any app. With the right tools and proper training, the employees can make the trip to the store worth the consumer’s time. With everything the company can provide, the rest of the store’s success lands on the employees and things that technology can’t provide. A great cosmetologist is the only reason a consumer will really bother to come into the store when their experience online could be quicker and easier. To be great at the job, employees have to be able to listen to what the consumer wants while providing creative feedback to prove their skills. They also need to be able to tell their clients the truth about what looks good, and what doesn’t, so the client knows they can rely on their word. The advancement of tech is going in all directions. We all want to look and feel good, so the improvement of beauty products shouldn’t be a surprise. Whether we’re going the route of AR try-on apps or simply making better ways to have healthy skin, technology is going to keep pushing us forward to have better products than yesterday.